Our focus has always been on using higher-quality ingredients and classic cooking techniques to make great food accessible at reasonable prices. We also work to know the sources for all of our ingredients, so that we can be sure they are as flavorful as possible while being mindful of the environmental and societal impact of our business. We call this idea, Food With Integrity, and it guides how we run our business—the end result of which is delicious. National Gift Card is the best place for you to order Chipotle gift cards in bulk. We are the experts in all things gift cards and can set up your gift card solutions program for you today. Please contact us for more information on bulk, direct-to-recipient, or individual gift card fulfillment for your gift card program. Contact us here or call us at 888-472-8747 today! Treat your Chipotle gift card like cash, that may only be used for making purchases at Chipotle restaurants. However, it cannot be redeemed for actual cash or applied as payment to any account unless required by law. It cannot be used to purchase other Chipotle gift cards, because that’s like wishing for more wishes. Unauthorized resale is prohibited. If you purchase this card from a re-seller, you do so at your own risk, as cards sold by a re-seller may not have any value. Chipotle is not responsible for unauthorized use of this card. Except in certain circumstances, the value on this card will not be replaced if the card is lost, stolen or destroyed. Use of this card constitutes acceptance of these terms and conditions. This can only be redeemed in the USA. 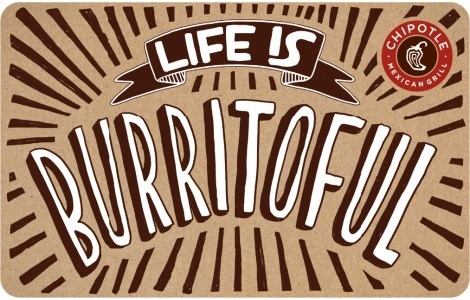 Check your balance at any Chipotle restaurant, online at www.chipotle.com, or call 1-877-925-4878.